I don’t know about you, but in my family, seafood is always a good choice for dinner. We may not live near the sea or down south, but it doesn’t mean that we can’t bring those big flavors into our kitchen. But when it comes to deciding what kind of seafood to make, it always gets me in a pickle – I love them all! 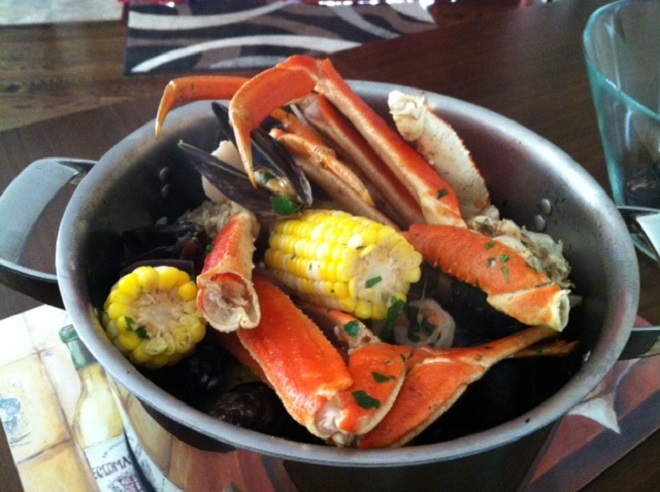 Therefore last night we made a Crab and Seafood Boil – a combination of crab, mussels, shrimp and scallops! If you are like me and don’t live by the water, check out your local grocery store for their seafood selection or specialty fish markets. I know some will even cook and breakdown the crustaceans for you if you do not feel comfortable doing it yourself. Start off by bringing the water, wine, garlic, butter and spices to a rolling boil. Place the corn in the pot and cook for 10 minutes. Next the crab, scallops and mussels – cook for about 5 minutes (until the mussels are open) Add the shrimp and parsley and cook for 2 more minutes, until the shrimp has turned red. Finally neatly arrange all of your cooked foods onto a large serving platter and enjoy! Hi, I�ve already been a lurker about your blog for a few months. I love this article and your entire website! Looking forward to reading through more!